The Content Marketing Project Management Matrix is a useful tool for Content Marketing managers looking to prioritize all of their competing projects and initiatives. Taking the time to input different potential projects into the matrix will help content marketing professionals determine the priority level of each project according to its impact and when it should be completed. This ensures that content marketers are focused on the right projects – projects that will bring you one step further to hitting those marketing benchmarks. In Quadrant One, High Impact, Due Soon, you will include the content marketing projects that best align with your marketing objectives. These highly important tasks also have a deadline that is approaching soon. In Quadrant Two, High Impact, Due Later, you will include important marketing projects that do not have to be completed right now. In other words, it is critical that these projects are completed, but they do not need your focus right now. 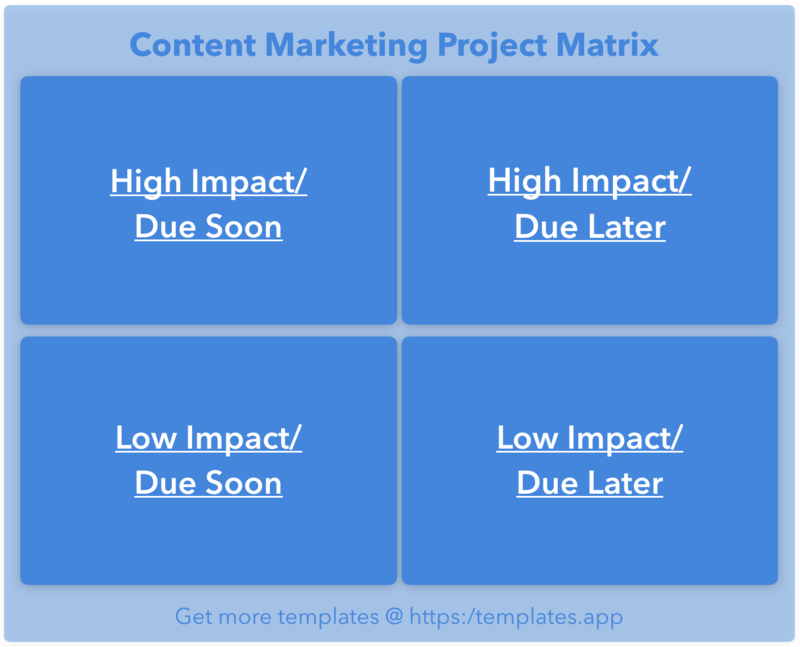 In Quadrant Three, Low Impact, Due Soon, you will include projects that have a deadline coming up, but these tasks will not make or break your marketing efforts. An example of this is responding to emails about somebody who would like to guest post on your blog. Many times, these types of tasks can be delegated to assistants or interns. In Quadrant Four, Low Impact, Due Later, you will include projects that you would like to consider working on in the future if time and resources allow. You can think of this as a “brain dump” for projects you would like to see done one day. You can view edit and import the Content Marketing Project Matrix here.